This is a summary and modification of Kasbohm & Schoene (2018), Rapid eruption of the Columbia River flood basalt and correlation with the mid-Miocene climate optimum, Science Advances vol. 4, no. 9, eaat8223 http://advances.sciencemag.org/content/4/9/eaat8223. An adaptation for lay readers can be found at https://www.princeton.edu/news/2018/09/19/crystals-climate-new-gold-standard-timeline-connects-volcanic-eruptions-climate. The volcanic ash found between two Wanapum Basalt flows yielded zircons that were dated to constrain the age of a magnetic field reversal in the Columbia River Basalt Group (Photo credit: Jennifer Kasbohm, Princeton University). Fig. 1. 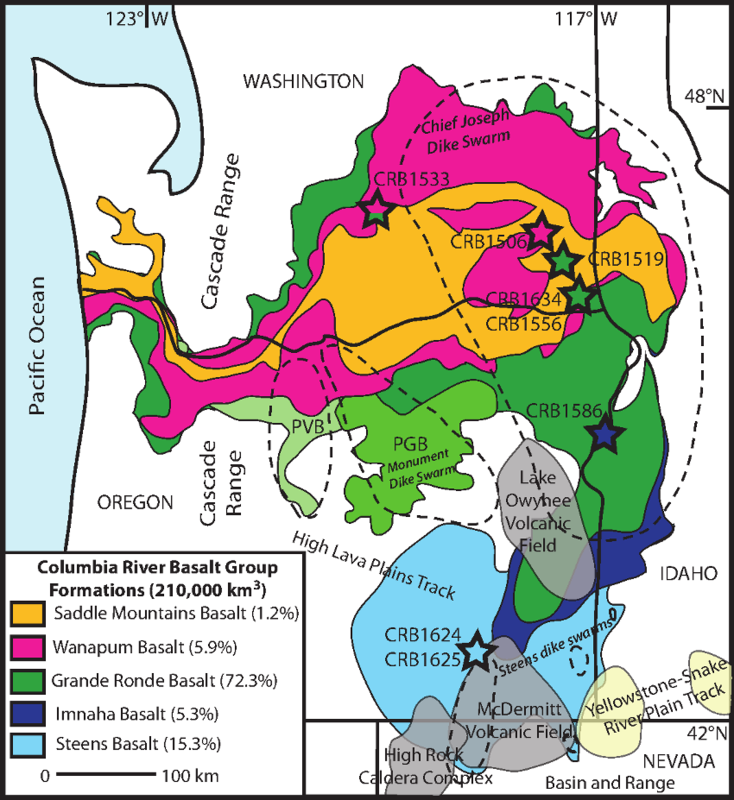 Map of Columbia River Basalt Group and Regional Volcanism. The map shows the areal extent of each formation of the CRBG, and the legend provides the volume contribution of each formation. Stars represent geochronology sample collection sites; dashed lines enclose areal extent of source dike swarms. The Prineville Basalt (PVB) and Picture Gorge Basalt (PGB) are coeval with the Grande Ronde Basalt, and represent 1.4% of total CRB volume, and are grouped with the Grande Ronde Basalt for all volume estimates presented here (Reidel, 2015). The Columbia River Basalt Group (CRBG) is the youngest, smallest, and best-preserved continental flood basalt. It erupted ~210,000 km3 of lava in the Pacific Northwest, USA between ~17 and 5 Ma. Forty-three distinct stratigraphic members with volume estimates have been defined using regional correlations based on detailed mapping, geochemistry, and paleomagnetic data (Reidel, 2015). While many flood basalts have been implicated in mass extinction events (Courtillot & Renne, 2003), the CRBG is not associated with a mass extinction event and its total volume is up to an order of magnitude smaller than other flood basalts. However, single members yielded comparable volumes of lava (thousands of km3) to single formations of large igneous provinces implicated in mass extinctions (e.g., Deccan Traps (Self et al., 2006)), and therefore may have had comparable short-term climate impacts (Barry et al., 2013). The ~17-15 Ma Mid-Miocene Climate Optimum (MMCO) is marked by high latitude sea surface temperatures 4-6°C above background temperature (Shevenell et al., 2004) and is associated with vertebrate migrations and increased species originations (Böhme, 2003). In paleoclimate records, the MMCO is marked by a benthic d18O minimum, a benthic d13C maximum, an ice sheet extent minimum (Armstrong McKay et al., 2014), and a variety of pCO2 proxies which indicate a possible doubling of atmospheric CO2 levels to greater than 400 ppm (Foster et al., 2012; Kurschner et al., 2008; Zhang et al., 2013). Given the apparent timing of both events, many studies have suggested that the environmental perturbations of the MMCO are connected to CRBG eruptions (Foster et al., 2012; Hodell & Woodruff, 1994; Reidel, 2015), but high-precision geochronologic data that link the two events are lacking (Armstrong McKay et al., 2014). We aim to test the hypothesis that there is a temporal relationship between CRBG eruptions and the MMCO by establishing an accurate and precise age model for the eruption of the CRBG. The majority of ages published on the CRBG have uncertainties that preclude the development of an unambiguous chronology for the timing and duration of CRBG volcanism. An age model derived from a recent review of K-Ar and 40Ar/39Ar geochronology for the CRBG (Barry et al., 2013) is based on geochronologic analyses with large uncertainties (>1 Ma) that make adherence to stratigraphic order difficult to address, and the result is that it is inconsistent with the Geomagnetic Polarity Timescale (GPTS) (Hilgen et al., 2012). Improving the precision of CRBG geochronology will help resolve the timing and duration of CRBG volcanism and its correlation to the GPTS and MMCO. Fig. 2. Columbia River Basalt Group Geochronology Samples. 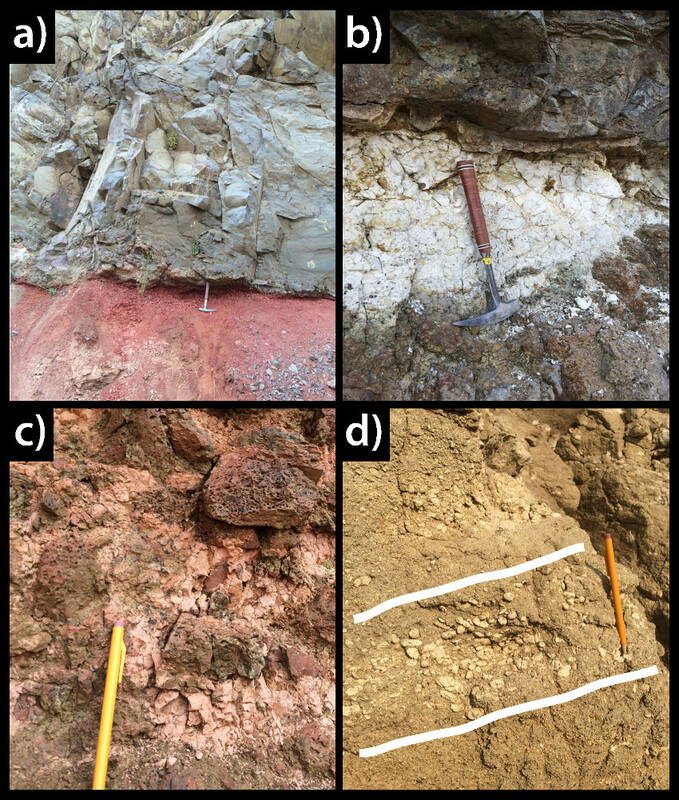 Certain interflow lithologies were targeted for sampling and found to contain magmatic zircons, allowing for high-precision dating techniques to be applied: (A) redboles, analogous to those found in the Deccan Traps; (B) ashes deposited from Cascade subduction volcanism or other silicic centers; (C) ash-bearing sediments trapped in brecciated basalt flow tops; and (D) pumice clasts in the Vantage sedimentary interbed; the horizon with these cm-scale clasts is outlined in white. In this study we use U-Pb zircon geochronology by chemical abrasion-isotope dilution-thermal ionization mass spectrometry (CA-ID-TIMS), which can achieve the precision (~0.1%) and accuracy required to address the issues with prior age models outlined above. Because basalts are generally too low in Si and Zr to saturate zircon, we follow the sampling strategy of Schoene et al., (2015) by collecting silicic volcanic ash from between basalt flows and dating them by U-Pb geochronology on single zircon crystals. These ash beds were sourced from contemporaneous regional silicic volcanism, and deposits include ash-bearing paleosols (referred to as “redboles”), interflow volcaniclastic sediments, and pumice-bearing airfall tuff (Fig. 2). Zircons separated from these samples were dated by CA-ID-TIMS at Princeton University. Fig. 3. U-Pb Zircon CA-ID-TIMS Geochronological Data. Rank order plot of geochronological data presented in this study, with sample names and the youngest, most precise zircon age starred and labeled. Error bars represent 2s uncertainty, and stratigraphic younging is from left to right. We present a timeline, shown with background shading and labels, for the eruption of each formation based on the stratigraphic position of these samples and consistent with our geochronology results. Steens Basalt geochronology is compared to the most recent high-precision 40Ar/39Ar geochronology results (Mahood & Benson, 2017), and is found to overlap U-Pb data when recalculated with the Fish Canyon Sanidine age of Kuiper et al. (Kuiper et al., 2008). 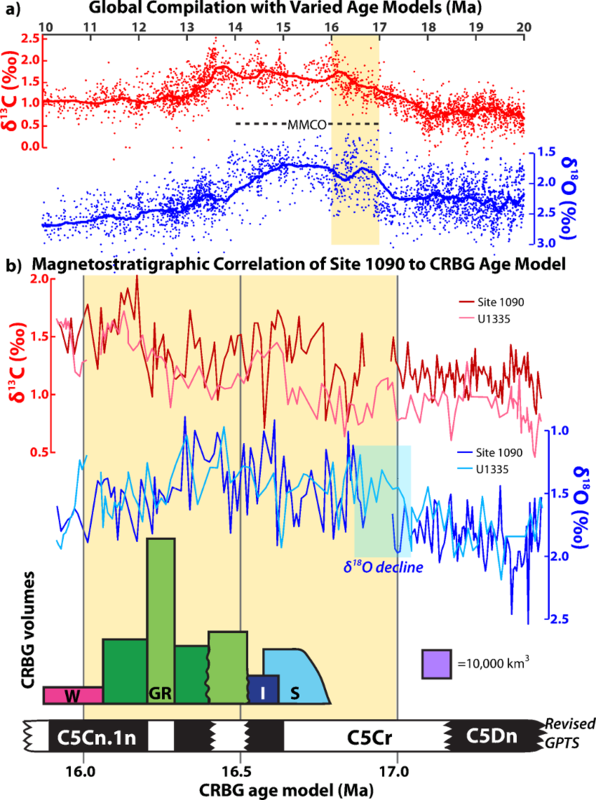 Data from eight horizons within the CRBG, reported as 206Pb/238U dates from single zircons taken from a population of dated grains with 95% confidence intervals, are shown in Fig. 3. Dates on single crystals within each sample spread beyond analytical uncertainty, a common observation in volcanic ashbeds, because zircon can retain radiogenic Pb at temperatures of >900°C, and may crystallize long before eruption. In light of potential sources for complex zircon populations deposited within the CRBG ashes (Miller et al., 2007; Simon et al., 2008), we use the youngest single concordant analysis, excluding low precision analyses, as an estimate for the age of the ash (Schoene et al., 2010) (Fig. 3). This approach is tested by dating a large number of zircons from each sample to obtain multiple analyses that overlap with the youngest grain, and further requiring that samples from stratigraphically higher positions in the CRBG are in chronological order. Our zircon ages improve estimates for the timing and duration of each formation of the CRBG stratigraphy (Fig. 3), and indicate that 95% of its total volume erupted in 758±66 ka, 2.4 times faster than previous estimates. Combined with detailed volume estimates for each member of the CRBG (Reidel, 2015), our new zircon ages yield effusion rates throughout the eruptive history of the CRBG and provide a timeline for the release of CO2, SO2, and other gases into the atmosphere. For the main phase of eruption (Steens, Imnaha, and Grande Ronde Basalts), we calculate an average effusion rate of 0.334±0.042 km3/yr, which is double the prior estimate of 0.178 km3/yr for the same interval (Camp, 2013). 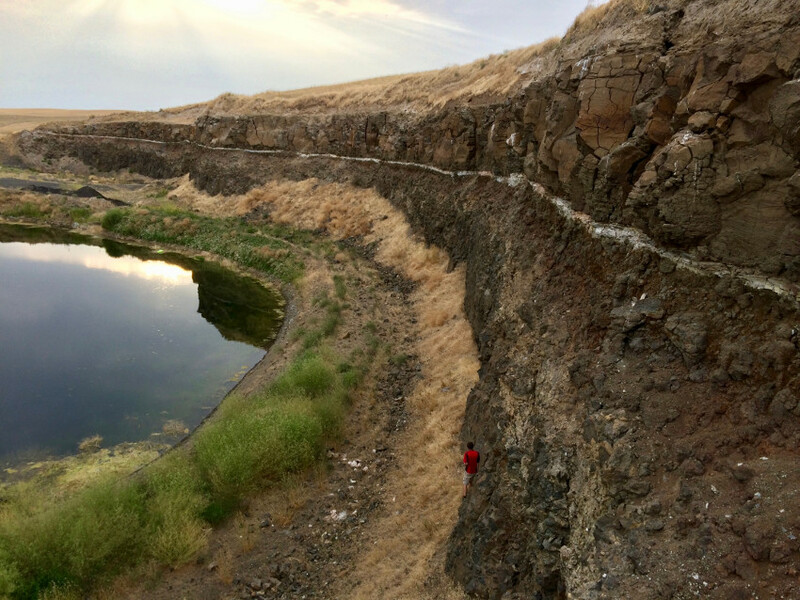 During the eruption of the Wanapum Basalt, the rate slows to 0.055±0.014 km3/yr, whereas during the eruption of the Grande Ronde Basalt’s Wapshilla Ridge Member, which comprises 20% of the total CRBG volume, the average rate calculated is 1.18 km3/yr, with a minimum rate of 0.376 km3/yr. However, because our ages for the top and bottom of this voluminous member in a single stratigraphic section are nearly the same, effusion rates were likely far greater than the average values. Our initial data do not identify any significant hiatuses in eruptions – no more than ~200 ka elapse between any two of our samples, during which volcanism is known to be ongoing even though we do not present zircon data from these intervals. While most flood basalt provinces are thought to relate to mantle plume-driven processes, models for the origin of the CRBG include a mantle plume source (Camp, 2013), but also subduction-related processes such as slab tear (Liu & Stegman, 2012) or slab rollback (Long et al., 2012). Our age model provides quantitative constraints that must be satisfied by any geologic or geodynamic model for CRBG volcanism. In particular, the mechanism must be consistent with: (1) eruption duration of ~750 ka from 16.65-15.90 Ma; (2) an average effusion rate of 0.334±0.042 km3/yr, with pulses of >>1 km3/yr; (3) simultaneous eruptions at Steens Mountain and in the Imnaha Basalt vents 300 km away; and (4) an average linear geographic propagation rate of eruption of 0.37±0.08 m/yr to the north, given distances between the vents sourcing Imnaha through Wanapum eruptions. These criteria alone are currently insufficient to fingerprint a mantle plume or subduction-related origin of the CRBG, but may inform future models. Determining the relative timing of CRBG volcanism and the MMCO requires independent chronologies that are equally precise. However, the early- and middle-Miocene is one of the most problematic periods in the Neogene for establishing precise independent chronologies in marine sediments due to the difficulty in obtaining undisturbed stratigraphic sections that yield reliable magnetostratigraphy, biostratigraphy, astronomical tuning, and radiometric ages (Hilgen et al., 2012). All timescales proposed for the middle-Miocene depend directly or indirectly on correlation with the GPTS, for which there are currently several proposals, the most recent being the Geologic Time Scale (GTS) 2012 (Hilgen et al., 2012). GTS 2012 was derived from the seafloor anomaly profiles of the Antarctic and Australian plates and assuming a relatively constant spreading rate (Hilgen et al., 2012); it is the only portion of the Neogene timescale calibrated in this way, rather than through astronomical tuning of a section with magnetostratigraphy, and it disagrees with some alternative proposals calibrated astronomically (Billups et al., 2004; Kochhann et al., 2016). Fig. 4. Revised CRBG Eruptive Timeline, Magnetostratigraphy, and GPTS Correlation. U-Pb geochronology suggests a timeline of the eruption for each formation (from Fig. 3) as well as a revised GPTS consistent with CRBG magnetostratigraphy. These are compared to the eruptive chronology derived from 40Ar/39Ar geochronology (Barry et al., 2013) and different GPTS calibrations (Billups et al., 2004; Hilgen et al., 2012; Kochhann et al., 2016). Given the magnetic polarity of different stratigraphic members, U-Pb geochronology constrains the age of four different chron boundaries (straight lines), identified with arrows and ages with internal and decay constant uncertainties. Estimated chron boundaries are shown with zigzag lines, and are not yet constrained by geochronology. 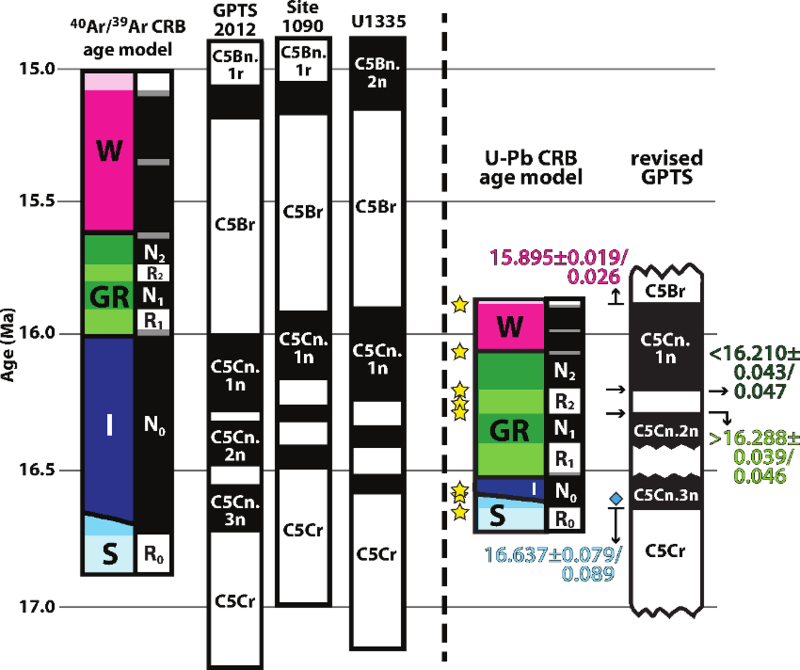 Lighter shades of color in the stratigraphic column represent reversed polarity intervals in CRBG magnetostratigraphy, also shown by adjacent reversal stratigraphy to the right of each CRBG age model. Stars indicate the youngest zircon ages obtained for each sample in the study, and letters label each formation (S – Steens Basalt; I – Imnaha Basalt; GR – Grande Ronde Basalt; W – Wanapum Basalt). The blue diamond represents the age of the Steens reversal obtained in Mahood & Benson (Mahood & Benson, 2017), recalculated with the Fish Canyon Sanidine age of Kuiper et al. (Kuiper et al., 2008), to be 16.603±0.028/0.36 Ma, which is consistent with our results. Our new age model for the CRBG permits a more robust correlation of CRBG magnetostratigraphy with existing proposals for the GPTS than did prior age models (Fig. 4). However, this exercise also indicates that some prior proposals for the GPTS, including GTS 2012, are in error. By correlating magnetic field reversals in the CRBG with the GPTS, we can refine four proposed reversal ages (Fig. 4); further work will continue to refine the record of middle-Miocene magnetic field reversals. Figure 5: Correlation of the Columbia River Basalt Group with the Mid-Miocene Climate Optimum. (A) A compilation of proxy records exhibiting the MMCO (Zachos et al., 2008), with age constraints as reported in each study. Although ages are susceptible to uncertainties in the Mid-Miocene timescale, the magnitude of the isotopic signals are not. (B) In order to compare zircon geochronology results for CRBG eruptions to paleoclimate proxy records of the MMCO, it is necessary to bypass age models tied to outdated calibrations of the GPTS. The robust magnetostratigraphy of Sites 1090 (Billups et al., 2004; Channell et al., 2003) and U1335 (Kochhann et al., 2016) allows for correlation of these isotopic records to our CRBG eruption chronology and refined GPTS. The area of each colored rectangle corresponds to the volume of each formation (Reidel, 2015) (S – Steens Basalt; I – Imnaha Basalt; GR – Grande Ronde Basalt; W – Wanapum Basalt), with width constrained by zircon ages (slanted boundary indicates that the onset of Steens Basalt volcanism is not yet constrained); polarity of the basalt flows is taken from Reidel (Reidel, 2015) and references therein. Yellow shading compares global proxy data at 17-16 Ma (lacking an age model based on absolute geochronology) with volcanic events occurring 17-16 Ma, while the light blue shading highlights the onset of the MMCO in both records with the drop in δ18O. Given the inconsistencies described above for the GPTS, demonstrating a link between the eruption of the CRBG and the MMCO requires a careful assessment of the age models used to develop proxy records across the MMCO. One way forward is to use proxy records from sites that contain reliable magnetostratigraphy (Channell et al., 2003; Kochhann et al., 2016). Benthic d18O values – a proxy for deep-ocean temperature - from Sites 1090 (Billups et al., 2004) and U1335 (Kochhann et al., 2016) (Fig. 5) indicate that the decline in d18O values began during what is interpreted as C5Cr, reaching a nadir (the MMCO) during C5Cn.3n-C5Cn.1r. While it is currently difficult to validate the identification of C5Cr from site 1090 given potential for hiatuses in the record, it is corroborated by the astronomical model of U1335 and is interpreted to be the same chron in which CRBG eruptions began with the Lower Steens Basalt. Although the absolute timing of the onset of the MMCO cannot be confirmed by our data, the astronomically tuned record from U1335 compared to our geochronology show that the decrease in d18O preceded the eruption of Steens Basalt lava flows by 100-200 ka. CRBG volcanism may have played a role in eliciting global warming through cryptic degassing of CO2 as magma migrated through dike swarms prior to surface eruptions (Armstrong McKay et al., 2014). Alternatively, the apparent mismatch between the onset of the CRBG and the MMCO may indicate that the two events are unrelated. Regardless, the d18O minimum appears coeval with the eruption of the Grande Ronde Basalt, suggesting that a link may exist. Further work that refines age models for climate proxy records across the MMCO and investigates rates of eruptions for the CRBG is required before it can be determined if the CRBG caused the MMCO. Despite uncertainties present in Mid-Miocene age models, global proxy data (Zachos et al., 2008) indicate that the MMCO continued for >1 Ma after the cessation of the majority of CRBG volcanism (Fig. 5). The time lag between the cessation of volcanism and a return to cooler climatic conditions could be understood as a consequence of the long response time of negative feedbacks within the global carbon cycle that regulate atmospheric CO2 and Earth’s temperature on geologic timescales. These feedbacks include interactions between temperature, the chemical weathering of continental silicate minerals, and the burial of CO2 in marine carbonate sediments (Walker et al., 1981). While the sensitivity of the silicate weathering feedback remains poorly understood, recent estimates for response times vary from ~200-500 ka (Stolper et al., 2016) and are consistent with the stabilization of atmospheric CO2 (i.e. return to baseline conditions) on ~1 Ma timescales. Our age model of CRBG emplacement shortens the duration of volcanism from 1.9 Ma (Barry et al., 2013) to 750 ka and correlates the onset of CRBG volcanism and the onset of the MMCO to within ~100 ka. A shorter duration of CRBG volcanism implies higher average CO2 emissions and higher peak CO2 concentrations during volcanism, to be compared with marine proxy records. However, current proxy records for atmospheric CO2 during the MMCO are too coarse for a close comparison to the eruptive history of the CRBG, further inhibiting the ability to assess whether or not the CRBG caused the MMCO. Future studies should focus on further revision of the Mid-Miocene timescale and a high-resolution climate proxy record spanning the 700 ka duration of CRBG volcanism to explore the extent to which the timing of CRBG volcanism agrees with changes in atmospheric CO2. Such studies will lead to an improved understanding of the MMCO, more general models linking volcanism to climate change, and could be crucial for understanding why some flood basalts apparently result in mass extinctions and others do not. Barry, T. L., Kelley, S. P., Camp, V., Self, S., Jarboe, N., & Duncan, R. (2013). Eruption chronology of the Columbia River Basalt Group. Geological Society of America Special Paper, 497, 45–66. https://doi.org/10.1130/2013.2497(02). Camp, V. E. (2013). Origin of Columbia River Basalt: Passive rise of shallow mantle, or active upwelling of a deep-mantle plume? Geological Society of America Special Paper, 497, 181–199. https://doi.org/10.1130/2013.2497(07). Hilgen, F. J., Lourens, L. J., & Van Dam, J. A. (2012). Chapter 29 - The Neogene Period. In The Geologic Time Scale. Zhang, Y. G., Pagani, M., Liu, Z., Bohaty, S. M., Deconto, R., & A, P. T. R. S. (2013). A 40-million-year history of atmospheric CO2. Philosophical Transactions of the Royal Society of London., (September).